The ideal basic protection from all types of spyware and viruses for your personal computer. The antivirus is regularly automatically updated and so is always prepared to stop the latest viruses, worms, trojans and malware in general. Heuristic analysis even allows the detection of those viruses which haven't been fully defined yet. The antivirus uses powerful technology with two scanning engines. The ideal basic protection from all types of spyware and viruses for your PC. ...... The resident protection reliably blocks attempts to run malware. Depending on the repair settings the defective file is renamed, moved to quarantine or permanently deleted. It is possible to carry out regular or one-time scans of the entire disk, selected folders or files. Scanning can be planned on regular weekly, daily or hourly cycles but of course it can also be carried out manually according to current needs. Thanks to the use of two top-of-the-range scanning engines, the antivirus is able to achieve one of the highest detection rates in the world. It is able to detect and stop practically all existing viruses, worms and trojans. 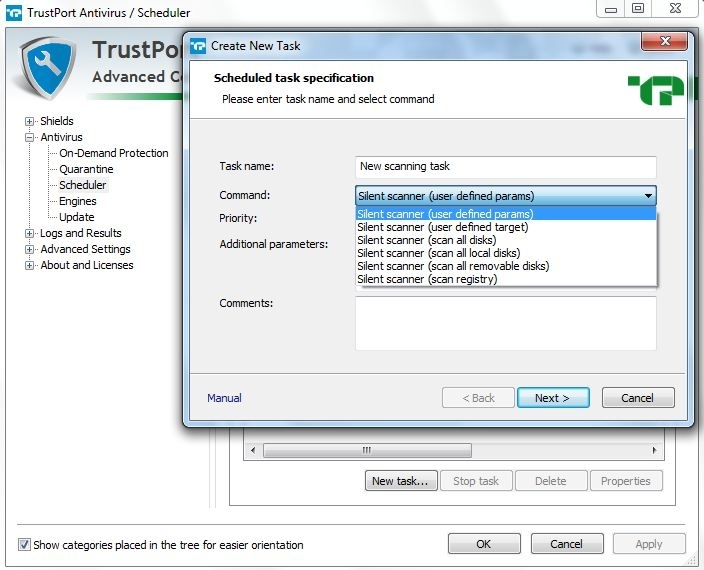 Qweas is providing links to TrustPort Antivirus 2012 12.0.0.480 as a courtesy, and makes no representations regarding TrustPort Antivirus or any other applications or any information related thereto. Any questions, complaints or claims regarding this application TrustPort Antivirus 2012 12.0.0.480 must be directed to the appropriate software vendor. You may click the publisher link of TrustPort Antivirus on the top of this page to get more details about the vendor.